Who uses NASA Earth science data? Dr. Joan Ramage, to study glaciers and snowmelt. 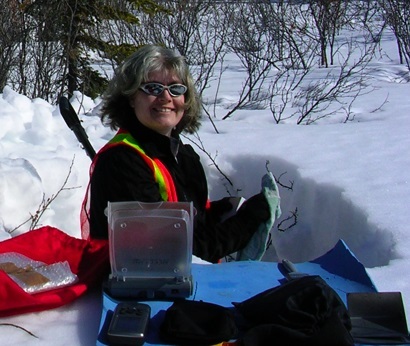 Dr. Joan Ramage collecting data from a snow pit near the town of Faro in the Yukon Territory, Canada. Image courtesy of Dr. Ramage. Research interests: Past glaciations and their impacts in North and South America, the distribution and change of modern glaciers around the world, and hydrologic impacts of snowmelt. Research highlights: Severnaya Zemlya is a forbidding place in which to conduct research. Located in the Russian High Arctic north of Siberia’s Taymyr Peninsula, it has a large population of collared lemmings (Dicrostonyx torquatus), no permanent human population, and a mean annual temperature of 5.4 degrees Fahrenheit. It does, however, have glaciers. More than 20 significant glaciers cover the four main islands making up this archipelago. For Dr. Joan Ramage, these glaciers are an important part of her studies into the distribution of glaciers and the impacts of environmental changes to glaciers, snowpack, and the cryosphere. Dr. Ramage’s research concentrates on measuring when and where glaciers and seasonal snow are melting, and the impacts of this on mountain hydrology, glacier mass balance, and glacier dynamics. Along with Severnaya Zemlya, her research has taken her to the Andes in South America, mountainous areas in Asia, and the Yukon River basin in Northwest Canada and Central Alaska. While Dr. Ramage conducts field research and observations, these research sites are often at high latitudes and/or high elevations and in conditions that are, to say the least, challenging. Data collected by instruments aboard Earth observing satellites are an important source of additional research data and a key resource for observing large-scale changes spanning great distances or long periods of time. Satellite observations, however, come with their own set of challenges. For instance, visual and near infrared observations often are limited by cloudy conditions and the perennial darkness of the Arctic and Antarctic winters. As a result, Dr. Ramage uses data from a variety of satellites, especially data collected by passive and active microwave sensors. Unlike instruments that require illumination from the sun or clear conditions to create images, microwave instruments sense radiated energy and are able to acquire images in cloudy and dark conditions. This gives Dr. Ramage and her colleagues the ability to collect data throughout the winter season, during storms, and at night. As Dr. Ramage points out, tracking glacier movement and surface snowmelt often requires multiple observations using data from several orbiting microwave instruments. One suite of instruments Dr. Ramage uses comprises the Special Sensor Microwave/Imager (SSM/I) and Special Sensor Microwave Imager/Sounder (SSMIS) aboard the Defense Meteorological Satellite Program (DMSP) series of satellites, the Advanced Microwave Scanning Radiometer - Earth Observing System (AMSR-E) aboard NASA’s Aqua Earth observing satellite, and the Advanced Microwave Scanning Radiometer 2 (AMSR2) aboard the Japan Aerospace Exploration Agency’s Global Change Observation Mission-Water 1 "Shizuku" (GCOM-W1) satellite. The daily data from these instruments are particularly useful in her studies tracking hydrological responses to snowpack melting. NASA Terra/MODIS image of Severnaya Zemlya acquired July 6, 2001. 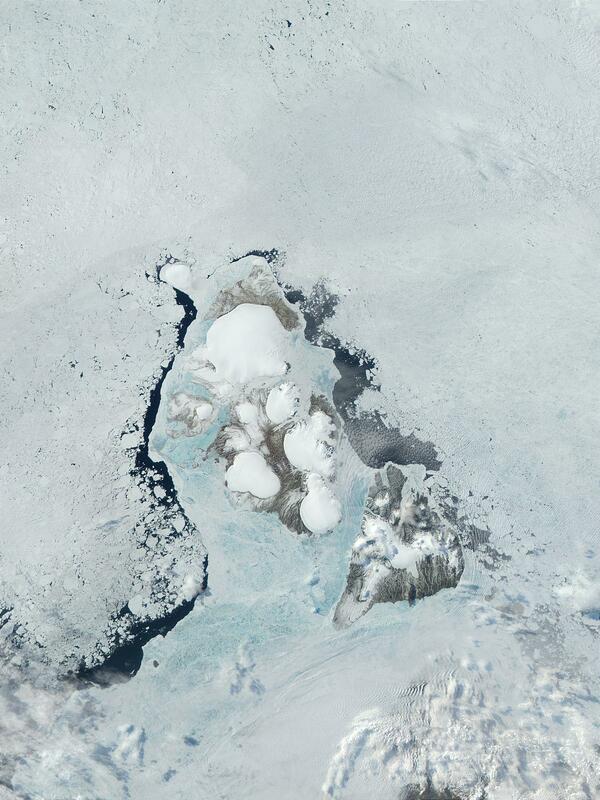 Glaciers appear as bright white circular objects against the bare brown land surface; puffy white areas are clouds; white/bluish-white areas surrounding the islands are sea ice. Credit: Jacques Descloitres, MODIS Land Rapid Response Team. In research conducted at Severnaya Zemlya and other locations in the Russian High Arctic using a combination of field observations and data from multiple satellites, Dr. Ramage and her colleagues examined how rising air temperatures are affecting glaciers and snowmelt. One result of these higher temperatures is that areas in the Arctic and sub-arctic are experiencing earlier snowmelt onset and a higher number of total melt days. This earlier snowpack melting and increased number of melt days has a significant impact on regional glaciers, which lose mass as they melt. This glacier melting also results in a large influx of fresh water into the surrounding seas that, in turn, impacts regional sea levels. In addition, while fresh, white snowpack reflects a great deal of incoming solar radiation, as the snowpack melts, the ground darkens and absorbs more solar radiation. This, in turn, increases the land temperature and leads to additional melting. Data collected by the research team indicate a link between land ice snowmelt dynamics and regional sea ice extent variations. In fact, as Dr. Ramage and her colleagues note in research exploring early snowmelt events in the Yukon River basin, “high latitude drainage basins are experiencing higher average temperatures, earlier snowmelt onset in spring, and an increase in rain on snow events in winter.” In this Yukon River basin work, the research team used meteorological and hydrological data from ground stations combined with passive microwave AMSR-E data and active microwave data from the SeaWinds instrument aboard NASA’s Quick Scatterometer (QuikSCAT) satellite to study melt onset. The team found that all melt events in the study area coincided with above freezing temperatures; a limited number of melt events corresponded to rain on snow events and a majority of melt events were linked to fog. The research team notes that the results of this study show the influence of warm air intrusions on snowmelt in some areas and indicate that there is a large variability in snowmelt across years and regions. Dr. Ramage also combines satellite data with models to simulate snowmelt runoff or test the effects of potential environmental changes. In another study conducted in the Yukon River basin, she used AMSR-E snowmelt timing and snow water equivalent (SWE) data as inputs into a model called SWEHydro to reconstruct snowmelt runoff. This model, which was co-developed by Dr. Ramage, is designed to quantitatively determine the relationship between snow distribution on the landscape, snowmelt timing, and spring stream runoff in high-latitude and high-altitude basins. Using AMSR-E brightness temperature (which is the fundamental parameter measured by passive microwave radiometers like AMSR-E) and diurnal amplitude variations (DAV, which are the differences between the early-morning [usually minimum] and late-afternoon [usually maximum] brightness temperature observations), the research team was able to determine the timing of melt onset and snow saturation. Runoff was calculated using pre-melt SWE data combined with terrain information and melt rate estimates. As Dr. Ramage observes, once snowmelt begins, there is a transition period characterized by daytime melting and overnight refreezing, resulting in high variations in brightness temperature and high DAV. Using the snowmelt rate during and after melt transition and the snowmelt flow during and after melt transition, the SWEHydro model was able to effectively simulate the increase in water flow from melting snow, peak timing and magnitude of this flow, and the volume of this flow. This shows that the SWEHydro model may be effective for quantifying spring snowmelt in remote areas lacking sufficient meteorological measurements. Dr. Ramage’s use of data from multiple satellites is an effective technique in her glacier and snow cover change studies in high latitude regions and some mountainous areas. Currently, using a newly developed multi-satellite high-resolution brightness temperature dataset available through the National Snow and Ice Data Center Distributed Active Archive Center (NSIDC DAAC), she is looking at smaller glaciers with higher relief and in more temperate environments. One somewhat elusive quantity she would like to be able to quantify is how much snow is melting in very remote places. Current satellite-borne instruments enable her to detect moisture in the near surface snowpack, but she and her colleagues find it difficult to turn this remotely-sensed presence of melt into a rate or volume. She hopes to rectify this gap through the development of additional datasets and further snowpack hydrology modeling. Thanks to the ability of Earth observing satellites to peer into every corner of the globe 24 hours a day and acquire imagery in a wide range of weather conditions, Dr. Ramage and her colleagues are able to access an ever-increasing trove of remotely-sensed data to supplement their field investigations and modeling of remote, frozen environments. Pfeffer, W., Arendt, A., Bliss, A., Bolch, T., Cogley, J., Gardner, A., . . . Sharp, M. (2014). “The Randolph Glacier Inventory: A globally complete inventory of glaciers.” Journal of Glaciology, 60(221): 537-552 [http://doi.org/10.3189/2014JoG13J176]. Zhao, M., Ramage, J., Semmens, K.A., Obleitner, F. (2014). “Recent ice cap snowmelt in Russian High Arctic and anti-correlation with late summer sea ice extent.” Environmental Research Letters (Special Issue: Focus on Northern Eurasia in the Global Earth System: Changes and Interactions), 9(4) [http://doi.org/10.1088/1748-9326/9/4/045009]. Semmens, K.A., Ramage, J., Liston, G. & Bartsch, A. (2013). “Early snowmelt events: detection, distribution, and significance in a major sub-arctic watershed.” Environmental Research Letters, 8(1) [http://doi.org/10.1088/1748-9326/8/1/014020]. Vaughan, D.G., Comiso, J.C., Allison, I., Carrasco, J., Kaser, G., Kwok, R., Mote, P., Murray, T., Paul, F., Ren, J., Rignot, E., Solomina, O., Steffen, K. & Zhang, T. (2013). “Observations: Cryosphere.” In: Climate Change 2013: The Physical Science Basis. Contribution of Working Group I to the Fifth Assessment Report of the Intergovernmental Panel on Climate Change [Stocker, T.F., Qin, D., Plattner, G.-K., Tignor, M., Allen, S.K., Boschung, J., Nauels, A., Xia, Y., Bex, V. & Midgley, P.M. (eds.)]. Cambridge University Press, Cambridge, United Kingdom and New York, NY, USA. Available online at http://www.ipcc.ch/pdf/assessment-report/ar5/wg1/WG1AR5_Chapter04_FINAL.pdf. Ramage, J. & Semmens, K.A. (2012). “Reconstructing Snowmelt Runoff in the Yukon River Basin Using the SWEHydro Model and AMSR-E Observations.” Hydrological Processes (Eastern Snow Conference special issue), 26(17): 2563-2572 [http://doi.org/10.1002/hyp.9226]. Yan, F., Ramage, J. & McKenney, R. (2009). “Modeling of high-latitude spring freshet from AMSR-E passive microwave observations.” Water Resources Research, 45(11) [http://doi.org/10.1029/2008wr007370].